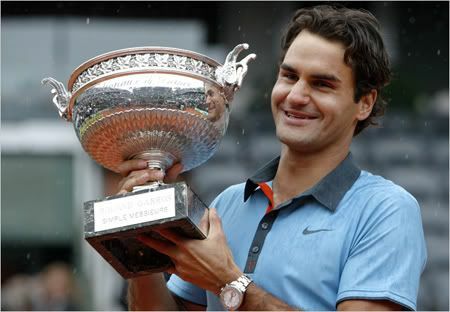 Roger Federer won the French Open and got his 14th grand slam title. As soon as he received the Coupe des Mousquetaires from Andre Agassi, people over at the online watch community websites started guessing which watch he was wearing. 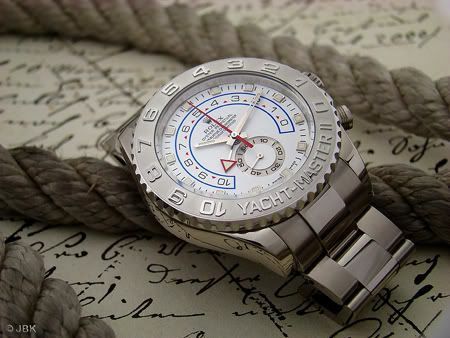 Although Rolex advertizes with Roger Federer wearing either a Rolex Daytona in white gold or an all gold Rolex GMT-Master II (he probably has all models anyway :)), Roger is wearing a Rolex Yacht-Master II. Anyhows, below is a picture of a YMII by Hannes/JBK, the subdial on 6 o’clock clearly demonstrates that this watch is the same as the one Roger Federer is wearing on the first photo. Michael over at the Dutch Rolex Forum spotted a gold Rolex Day-Date on the wrist of Roger’s wife, Mirka Federer.